" target="_blank">Strawberry Festival at the Cedar Circle Farm & Education Center in East Thetford. The sixth fest happens on June 29, with traditional strawberry picking (starting at 7 a.m.), guided informational tours of the fields and greenhouses, a puppet show, horse-drawn wagon rides, and live music from a group featuring Hafiz Shabazz, the director of Dartmouth University’s World Music Percussion Ensemble. Then there’s the food, which is all local, organic and, incidentally, really good. Of course, you can stay with the berry motif and have homemade strawberry shortcake, but you can also grab a slice of pizza from the Northeast Organic Farming Association’s mobile wood-fired oven, sink your teeth into a Vermont Smoke and Cure Sausage, and top it off with ice cream from nearby Strafford Organic Creamery. 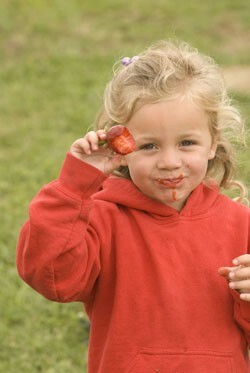 The Strawberry Festival showcases what Cedar Circle Farm is all about. Broadly speaking, co-manager Kate Duesterberg says, “We want our farm to be a resource for the community.” That means being a model for sustainable, organic agriculture, and educating the next generation of farmers about the nuts and bolts of local food systems. About 1500 adults and children picked, played and learned at the festival last year on the picturesque farm off Route 5. Families plied the rows of juicy red fruit while live music wafted to them, and the Strawberry Queen loped — on stilts — among kids painting flower pots. Pick enough strawberries to last a while, and you can relive the idyllic summer day a few times during winter’s fruitless deep-freeze.